Students from London's Building Crafts College got to see history in the milling when designer-makers Nicola Adamson and Hamish Low invited them to witness 5,300-year-old bog oak being sawn from the soaking log. In a fast and furious day dictated by the speed in which it is necessary to plank the boards before they start to feel the effects of the open air - think excavated Egyptian mummies here - Hamish demonstrated how these trees, possibly the rarest on earth, are milled, dried and made into furniture. Bog oaks emerge under the plough as the low-lying Fen country is cultivated, and Hamish makes a trip each winter, buying up suitable sub-fossilised specimens which have a branchless length of more than 100ft, then bringing them back to his timber yard near Lamberhurst in Kent. A sunny day in autumn saw us witnessing the milling process as he and a team of helpers set to, quarter-sawing whole butts, slicing smaller sections through-and-through, and covering them up again as soon as possible. Why the haste? The trees are extremely fragile when exposed to the elements and degrade very quickly. Hamish has to have confidence in his ability to spot good trees. He is looking for timber that would have fallen into the bogs of East Anglia as much as 7,000 years ago and been preserved well under the mud. He said: â€œThe trees died standing and the first ones to fall would have had an uninterrupted descent into the silt so be in a far better condition than those exposed for longer and consequently suffering insect infestation and fungal disease. "When first excavated the trees are at absolute fibre saturation which makes assessing the condition of the trees quite difficult. In addition to the colour it is possible to tell the condition of the tree by chipping away at the outer annual rings and by testing the level of resistance and density of the fibre. This assessment, together with the distance below sea level, indicates how much the sub-fossilised tree has changed its structure." "Making an accurate assessment of the structure is critical to the success of the drying process and it varies from tree to tree." 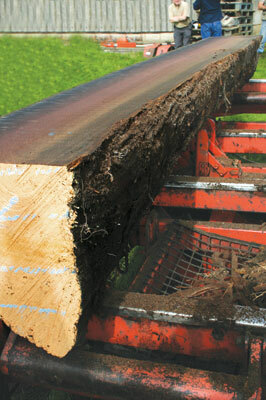 Bog oaks must be dried artificially and quarter-sawn to allow a consistent rate of moisture extraction, a process which will see a typical tree shrink by more than half as it loses 3.2 gallons of water per cubic foot. The width and thickness of each plank is reduced by around one third." Hamish added: "The challenge of drying bog oak is in extracting these huge amounts of water and incurring such a degree of shrinkage whilst still maintaining a flat, straight and split-free board." 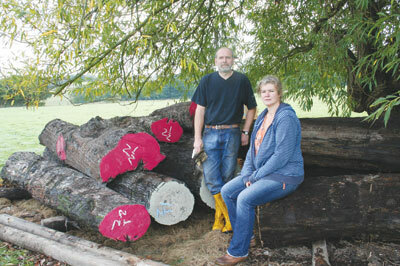 Until the sawing process the bog oak was stored under polythene, and with its ends painted, beneath a willow tree. 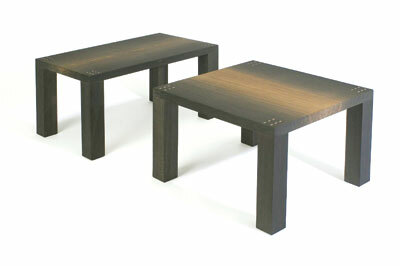 When dry, bog oak has a weight and density comparable to the most highly prized tropical hardwoods. When used in furniture the colour of the best trees fades from black on the outer annual rings to dark brown at the heart, an effect which is particularly striking when the tree is quarter-sawn, and the result of a chemical reaction between tannins in the oak and soluble irons present in the mineral subsoil. 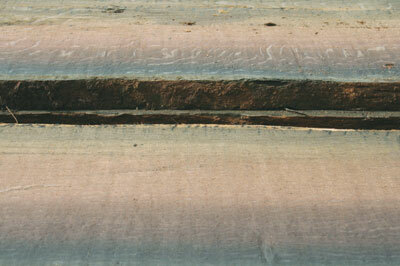 We, however, were also privileged to see something very unusual, logs that revealed a greenish stripe when sawn. There was just about time to take a couple of photographs before this precious stock was moved out of the split-provoking sunlight ready to go into the kiln, after which it is stacked and sticked under polythene ready to be made into delectable furniture. Hamish believes they are the only people to be buying bog oak in any quantity: from 200 trees exposed on a Lincolnshire farm last winter they bought 25 butts and had to allow for enormous wastage. For more information visit the website or follow them on Facebook.